Some things just seem meant to be. A homegrown coach who has reached the pinnacle of his profession is supposed to come home and resurrect the capstone football team of your state. He’s always said it was his dream, but the timing has never worked. When he was ready, the school wasn’t. But now is the magical moment. You need a coach and you’ve got the money to make it happen. Gus Malzhan was meant to coach the Arkansas Razorbacks. Born and bread a Razorback, Malzhan went on to become one of the greatest offensive minds in football. His offense played a major role in changing the game. Having proven himself as a coordinator and head coach, all the stars seemed to align this year for Malzahn to return home. He was offered more money than seemed logical, only to turn down the job. He’s not that good anyway. Obviously, a good coach didn’t suddenly go bad. Cleary a good man didn’t suddenly turn evil. Instead, a bunch of good people made poor observations about the situation and made bad conclusions about what happened. Situations are fluid. Until a deal is done, things are continually changing. Maybe Malzhan was coming to Arkansas midway through the season. Maybe Auburn wanted him to leave. But then he beat Georgia and Alabama. Maybe the fan base that was frustrated with him began to warm up. Maybe the administrators who were considering making a change were now open to making an extension. Sources are uncertain. Everyone seems to have a source, but few people truly know what is happening. Especially when skilled agents and professionals are at work, they are wise in not letting information out. This opens avenues for people to make up stories or form false conclusions. Probably the biggest issue with a hometown scenario–those we think would know the most often know the least. I like to hire people from our hometown. Every time I interview one, I tell them, “Don’t tell your parents until the decision is final.” I don’t want the candidate to have the added pressure of mom and dad influencing their decision. While others assume family and friends know the most, they might know the least. In addition, people who truly love a person try to give them distance when facing a big decision. True friends would never ask what decision the person will make. When it comes to sources, those who know the most likely say the least and those who know the least often say the most. Decisions are hard. I sometimes struggle to know what I want to order for lunch, I can’t imagine choosing between one of the most coveted jobs in the country versus the job I’ve always wanted. 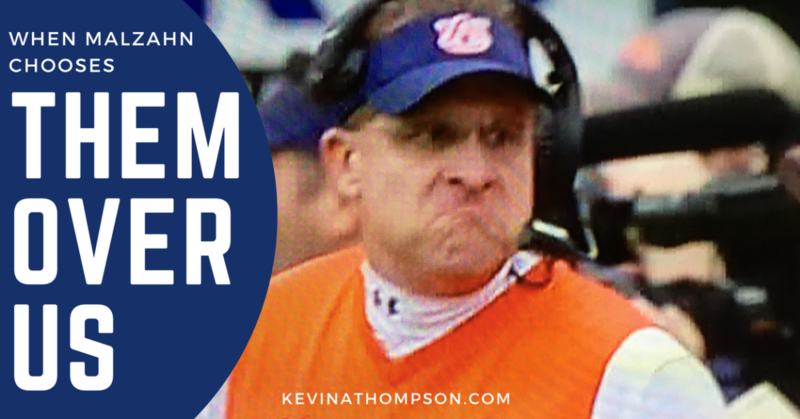 If someone doesn’t understand why Malzahn is staying in Auburn, they don’t understand college football, career success, or what it means to be a driven person. It’s fair to wish he would’ve chosen differently or think he should have chosen differently. But it is grossly ignorant or selfish to believe his choice was obvious and that he made the wrong one. Even if he did make the wrong decision, it was his to make so no one has a right to make a moral judgment on a choice that was morally neutral. Details are unknown. It’s vital to remember in all circumstances–no one knows the full story. In this case, not even Malzahn knows the whole story. He knows what he was told, but that’s it. But one thing we understand: he knows far more than us about this situation. Maybe he was uncomfortable in not knowing who his boss would be. Maybe he was told who the new Athletic Director would be and didn’t like it. Maybe he didn’t like the controlling nature of boosters or just was uncomfortable about the current direction of the program. Most likely, he looked at his recruiting class and didn’t want to start over in Arkansas. Whatever the details, no one knows all of them and the majority of us know practically none of them. It’s fair to be disappointed that Malzahn didn’t come to Arkansas. But if this situation changes your opinion of anyone involved, you are likely allowing your emotion to play too much into the scenario. A man–with a family–made the best decision he could in the moment. He might regret it. He might not. Time might allow him to remake it in a few years. Whatever the outcome, we are free to choose where we work and live. He didn’t reject us; he chose what was best for himself and his family.